Beaumont Health in Southfield and Universal Health Services (UHS) today announced they have formed a joint venture to address the growing, unmet need for accessible, high-quality and advanced mental health services in southeast Michigan and across the state. Beaumont selected UHS, one of the nation’s largest mental health hospital management companies, as its partner because of its long-standing commitment to patient and family-centered care, strong clinical outcomes, and proven track record of partnering with academic, regional networks, and community-based entities. UHS operates more than 200 mental health hospitals serving more than 600,000 patients annually across the country. UHS will be the majority owner of the joint venture and will oversee the day-to-day operations and management of the new mental health facility. “UHS is extremely pleased to be working with Beaumont Health, a premier organization, to provide these critically needed services in Michigan,” says Debbie Osteen, executive vice president of Universal Health Services and president of the Behavioral Health Division. “We will consider the new building our ninth hospital. However, this endeavor is so much more than bricks and mortar — it will be the new ‘hub’ from which we will coordinate the entire continuum of services for comprehensive inpatient and outpatient mental health care, clinical training and innovative new approaches to accessing care,” Fox says. 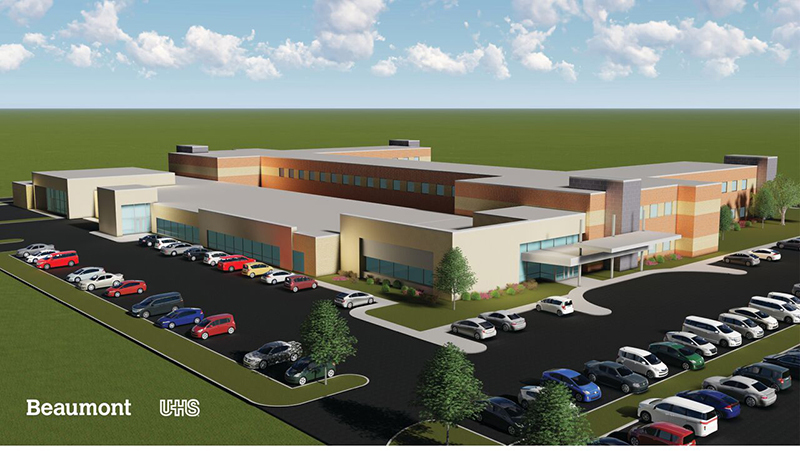 Within three years, inpatient mental health services across Beaumont Health will consolidate and grow into this one location, serving adult, pediatric, and geriatric patients. The current outpatient and day programs across Beaumont’s system will be enhanced to continue to meet the needs of patients who desire outpatient treatment closer to home. Mental health care continues to be at the forefront of societal concerns among health care providers, government officials, legislators, and community service organizations in Michigan and across the country. The Michigan House of Representatives released a report earlier this year from the House C.A.R.E.S. Task Force that provides recommendations on ways to improve mental health services across the state. The report focuses on a variety of different settings including health care, education, and criminal justice. In addition, the Michigan Health and Hospital Association have also created a task force on behavioral health. Both Beaumont and UHS actively participate in these conversations at a state level. Beaumont Health is Michigan’s largest health care system and has total net revenue of $4.5 billion and consists of eight hospitals with 3,429 beds, 187 outpatient sites, nearly 5,000 physicians, 38,000 employees, and 3,500 volunteers. In 2017, Beaumont Health had 175,688 inpatient discharges, 17,789 births and 574,591 emergency visits. For more information, visit beaumont.org. UHS today has annual revenue of $10 billion. Headquartered in King of Prussia, PA, UHS has more than 83,000 employees and through its subsidiaries operates more than 326 inpatient acute care hospitals and behavioral health facilities, and 32 outpatient and other facilities in the United States, Puerto Rico, and the United Kingdom.